The old adage that you have to be able to walk before you can run holds true for the modernization strategies of most IT organizations. While the hyperscale ranks have seamlessly built flexible, custom and highly efficient infrastructures - often without having to deal with lingering legacy assets along the way, since they never had any - the path to cloud has been far less straight and narrow for everyone else, and it will likely involve a much longer journey filled with stops and starts. IT budget growth is not really moving the needle, despite the sweeping transformations now possible through cloud automation. A 2015 report from Spiceworks revealed that only one-third of IT professionals expected budget increases at their organizations this year, down from 2014. Fewer dollars means less opportunity to pursue wholesale changes in IT, instead putting pressure on teams to first focus on increasing efficiency and productivity. On that note, old technical assets are not going away. In addition to the dedicated servers that continue to power applications everywhere, other pieces of infrastructure are not being updated, either. Spiceworks even estimated that more than half of the PCs on surveyed networks were more than four years old, despite two-thirds of respondents citing continued end-user growth (and nearly 60 percent identifying upgrade cycles) as good reason to add new hardware, software and services. This distinctive combination of tight budgets and complex, persistent legacy infrastructure means that even a seemingly simple move into a public IaaS provider like Amazon Web Services is not in the cards for a large chunk of IT organizations, despite the convenience it would provide. The ability to tap into cloud-like agility will instead need to be mediated by hybrid or private cloud IaaS that builds a sustainable bridge between past and future. So the quintessential picture of the current IT organization thinking of moving toward DevOps automation is one involving a collection of siloed teams that can see the possibilities in virtual and cloud infrastructure, but lack the culture, as well as the budgetary heft, to capitalize on them. For this reason, as we have noted many times here before, the challenge to modernization is not merely technical and financial, but also cultural and procedural. The stakes for overhauling operations and breaking down silos are so high that Gene Kim titled one of his 2014 contributions to The Wall Street Journal "Enterprise DevOps Isn't Mandatory - But Neither Is Survival." A major piece of the solution is moving infrastructure to cloud concepts. "Cloud computing's automation removes all that infrastructure friction," explained Bernard Golden in a piece last year for CIO. "Today it is trivial to obtain new computing resources in minutes, enormously faster than the weeks (or months) it used to take to get new infrastructure resources available. Today it is clear that lengthy infrastructure provisioning timeframes are imposed by organizational process, not the underlying infrastructure resource itself." This may be the case for totally modernized, greenfield, virtualized infrastructure, but the reality of many mainstream IT organizations' on-premises infrastructure presents a huge challenge. The trick is to make the morass of on-premises legacy and modern infrastructure as easy as cloud. In fact, while private cloud IaaS provides an apparent solution to infrastructure-related delays, its implementation is often ironically prevented by the sheer complexity of integrating mixed infrastructure into the IaaS to begin with. This is where QualiSystems CloudShell brings a different element to the picture by offering IaaS based on infrastructure environments that can include any combination of legacy, bare metal, virtual and public cloud resources, along with traditional, virtualized or software-defined networking. Creating IaaS that is comprehensive enough to pull in both old and new is the first step in the "walking" that IT organizations must do before they can get to the "running" of enjoying the benefit of greater agility across devtest and deployment. 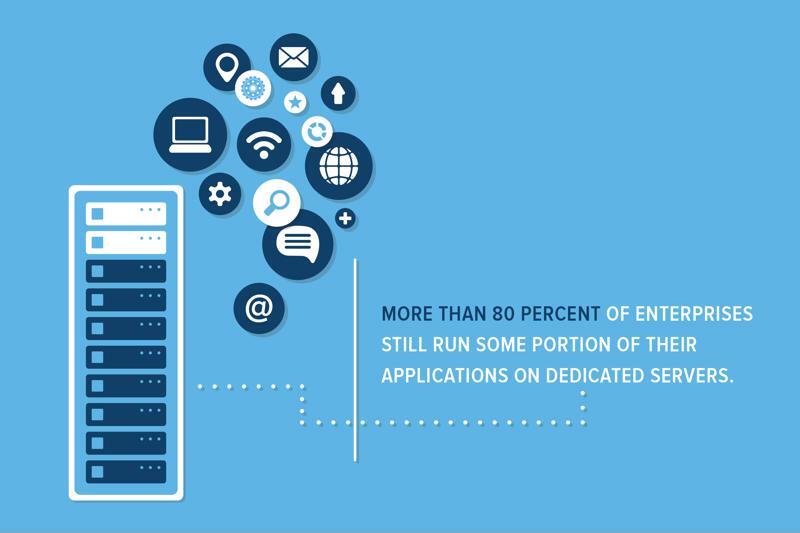 Private cloud IaaS and DevOps provide a way forward for legacy applications. Instead of the huge switch of going from legacy IT to all-in on public cloud, teams with mission-critical legacy applications to maintain may implement on-premises IaaS as part of a broader DevOps culture. This approach to IaaS provides the right starting point with a happy balance between application lifecycle acceleration and risk aversion, making it particularly suitable for any organizations that are simultaneously supporting old and new development initiatives - a phenomenon sometimes referred to by Gartner and others as bimodal IT. Thus, while net new applications can go full steam ahead in DevOps mode on public cloud infrastructure, private IaaS provides the first step in a more moderate but no less critical journey towards agility for legacy applications. "Private cloud IaaS provides a happy balance between application lifecycle acceleration and risk aversion." Private cloud may not be as hot a topic as public or even hybrid cloud, but demand for it is helping to drive up IT infrastructure investment around the world. IDC reported this July that private cloud spending would rise more than 16 percent year-over-year in 2015, behind the 32 percent growth of public cloud but well ahead of the flat rate for non-cloud IT infrastructure. One IDC executive observed that cloud services were not only growing in adoption but also diversifying in functionality to meet a variety of use cases. A separate report from Gemalto, about the Internet of Things, hinted at how the private cloud could be at the center of the IT ecosystems of tomorrow. Surveying telecoms rather than enterprises, this study found that 70 percent of respondents thought that private clouds would power IoT services due to the need for high levels of data security and control. Cloud infrastructure of some kind will be essential to the IoT because of the need for real-time data analysis and agile service delivery that traditional IT will not be able to provide. Self-service access to infrastructure environments that offer automated equivalents of traditional, manually constructed infrastructure environments. Much shorter provisioning times that offers standardization and enforces best practice methodologies. Taken together, these core features give teams the ability to modernize legacy applications, while also paving the way for practices such as continuous integration and deployment. Paired with the development of DevOps culture, IT organizations can use private cloud IaaS to get on the track toward greater business agility and support both their old and new applications. The takeaway: IT organizations need to overhaul their infrastructures as well as their processes. Private cloud IaaS based on a platform such as QualiSystems CloudShell that offers comprehensive support for mixed infrastructure environments, paired with a change of culture towards DevOps, is a sustainable path in the bi-modal journey of IT towards greater overall agility and cloud business models.